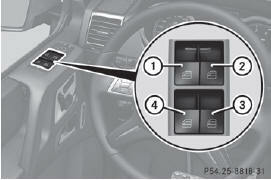 The switches for all side windows are located on the driver's door. There is also a switch on each door for the corresponding side window. The switches on the driver's door take precedence. The side windows cannot be operated from the rear when the override feature for the side windows is activated . : pull the corresponding switch. : press the corresponding switch briefly beyond the point of resistance. The side window opens completely. press or pull the corresponding switch again. You can continue to operate the side windows after you switch off the engine or remove the SmartKey. This function is available for up to five minutes or until the driver's or front-passenger door is opened.